Thread: Keep the winter rust at bay with ACF-50! With summer coming to a close, autumn is just around the corner. Of course, once autumn is out of the way, we've got winter to look forward to, and we all know what the greatest danger to our vehicle over winter is...RUST! ACF-50, Anti-Corrosion Formula, is a state of the art, anti-corrosion/lubricant compound, that has been specifically designed for the Aero Space Industry. It can be described as an ultra thin fluid film compound which must be applied on an annual basis. ACF-50 actively penetrates through the corrosion deposits to the base of the cell where it emulsifies and encapsulates the electrolyte, lifting it away from the metal surface. ACF-50 then dispels this moisture and provides an atmospheric barrier which prevents any further moisture contact, thereby keeping the cell inactive. This compound continues to actively penetrate and "creep" into the tightest of seams, lap joints, micro cracks and around rivet heads, dissipating the moisture, even salt water, in these corrosion prone areas. These unique abilities of ACF-50 remain effective for 12 months, gradually disappearing as it is chemically consumed. You can find further information and pricing HERE. Don't forget to use your forum discount to get an additional 10% off your order! All in all, this is a fantastic product that we are proud to stock - designed as an "all round" corrosion inhibitor that adapts to whatever task you throw at it. Available in a 13oz aerosol, 1 quart bottle (with refillable pump spray), 4 litre container and even a 20 litre drum which is perfect for the workshop. After a slightly thicker "grease" for your electrical contacts or wheel bearings on your trailer? Have a look below for the next great product from the same guys. It's no secret that equipment downtime, repair and replacement are expensive. It is also no secret that regular scheduled preventive maintenance is cheaper than the repair or replacement of expensive equipment. Available in a 57g tube and a 454g tub, you can view it HERE. In these days of dwindling maintenance budgets and closer scrutiny of operating costs and procedures, you can show a real saving through preventive control of corrosion. Corrosion Block can be described as a clean, clear, ultra-thin fluid which leaves a non-greasy atmospheric barrier to protect the base metal on interior surfaces. Corrosion Block leaves no gummy residue because it contains no wax, resin, tar, asphalt, silicone or telfon. You're probably thinking "that's great, but can it isolate the corrosion byproduct from my beloved electrical circuits?" Well, yes. yes it can. As well as offering the mentioned benefits, it also has many electrical uses. Corrosion Block has the ability to remove moisture, combined with its excellent penetrating and strong dielectric properties, have brought a number of electronics 'back from the dead' with just one application. The Corrosion Block removes the moisture from the corrosion byproduct, then isolates the corrosion byproduct from the electrical circuit. Corrosion Block can be used in many different electrical and electronic applications without fear of damage. Corrosion block will not harm paint or plastic surfaces. 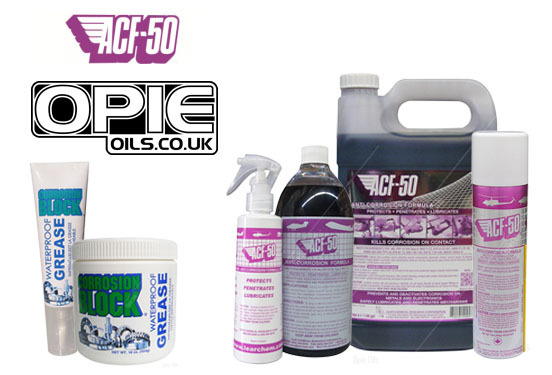 We're sure you'll find this new range of anti-corrosion products to your liking - at Opies, we don't stock a product unless we have complete confidence in it, so it's got our seal of approval. If you fancy a look at the full range of our rust preventatives and anti-corrosion treatments, you can find them all HERE. That's about it from us for today. As always, should you need any advice, please feel free to give us a call on 01209 202 949 or drop us an email to sales@opieoils.co.uk and we'll be happy to help. We're in the office Monday to Friday, 8:30 - 5:30.